When the recap is in progress hit F5 or refresh as often as you like for updates! The main event tonight is Roman Reigns vs. Dean Ambrose vs. Brock Lesnar with the winner going on to face Triple H at WrestleMania 32. Don't forget to follow Emerson @TheReallyRealEW and check out the Wrestling Outsiders website! -Before the show begins I would like to state my opinion that CM Punk will not be at Fastlane and will not be returning to WWE, at least not anytime soon. Even if you ignore that he has a valid UFC contract, he is still being sued by Dr. Amann, the lead doctor for the company. On the other hand, I am the same person who congratulated the Carolina Panthers on winning the SuperBowl. -Mauro Ranallo, Byron Saxton and JBL are your announce team. Not sure if Mauro sticks around for the entire show, but we'll see. a.) In a 2-out-of-3-Falls Match, US Champion Kalisto defeated Alberto Del Rio two falls to one. Del Rio keeps going after the mask of Kalisto, but that isn't working for him since Kalisto is just taking him to school. Del Rio went for a kick to the back, but Kalisto is so short that ADR kicked him in the head, but Kalisto still sold the back. They fought outside for minutes, but it was okay because the referee was the slowest counter ever. They fought near the timekeepers area. Kalisto went for a Springboard Something, but ADR picked up a chair and smashed Kalisto with it for the DQ. The second fall didn't start until we got a commercial break. I guess that's better than the second fall starting during the break. Del Rio won in 30 seconds with a jumping double foot stomp that looked better than the normal ADR double foot stomp. The third fall saw Del Rio go for the mask again. Kalisto made his comeback with a series of hurricaranas. Del Rio hit a reverse superplex that looked like they were setting up Salida Del Sol from the top rope. Del Rio beat on him outside the ring and gave him the double foot stomp off of the dasher boards and almost got the countout win, but Kalisto flew in at 9. ADR missed the double foot stomp inside the ring and Kalisto retained the title with a rollup. Sasha and Becky are fighting from the start. They both blind tagged themselves in, much to the chagrin of their partner. Becky at one point was doing a high kick dance on Naomi, which has to be seen to be believed. They got the heat on Becky and did all those fun tag team spots from the 80's to keep her from making the hot tag. At one point Tamina flung her out of the ring and Becky crashed and burned on the pretty black mats. Sasha finally got the tag and ran wild on the heels. She had the match won with the Bank Statement, but Tamina pulled her out. Sasha somehow kicked out of the Rear View and Becky broke up a cover after a Superkick. The finish was a double submission with Sasha's Bank Statement on Tamina and Becky's Disarmer on Naomi. The fans weren't as into it as you'd think since it's Dolph's hometown. The fans did a half assed dueling chant, which Owens mocked Dolph for. To give you an idea of how little people cared most of the people in the floor seats on the hard camera side were not watching. They were on their phones, talking to each other and one person looks like they are asleep. The fans finally woke up during a resthold. To each their own, I guess. This was an okay match, but you'll see 5 matches on Raw every week just as good, if not better. Owens slammed his shoulder into the ring post, but seemed to ignore such an injury 30 seconds later. Owens used his Fisherman Suplex Buster from the top rope and then they traded super kicks. JBL even made a Superkick Party reference. Owens went for the Power Bomb to the ring apron, but Dolph turned it into a Hurricarana into the ring steps. Back in the ring Owens won with a Pop Up Power Bomb. -Big Show was cracking his knuckles backstage with The Ryback and Kane. The three of them want to send the Wyatt's back to Hell. When were they in Hell the first time? They lost Bray Wyatt's rocking chair, so they stole Byron Saxton's announce chair and gave it to Bray. Byron could have looked under the ring for a spare folding chair, but instead he stood at the announce desk. Big Show and Erick Rowan wrestled just long enough to remember the good old days of when they had the first ever (and last ever) Stairs Match. Rowan cut off Ryback for the heat. I'd say the Wyatt's cut him off, except Rowan did it by himself. That didn't last long, as Kane was in soon and he got cut off too. I have a friend who was a Rose Bud once at the Royal Rumble. Why couldn't Vince have chosen him for the Strowman spot? Anyway, this match was bad. The fans cared for it less than they cared for the IC match. Ryback got back in and gave Harper the CM Punk knee's and then 7 body slams. The match broke down at this point and the chaos was the most enjoyable part. Remember when Braun kept getting killed by Brock? Things weren't much better for him here, as Big Show speared him to Hell outside the ring. The finish was Ryback pinning Harper with the Shell Shock. That was unexpected. Brie is wearing Daniel Bryan's kickpads that he wore at WrestleMania 30. I will apologize in advance because my computer took a crap at the end of the 6-man tag, so I am distracted in trying to get it to work. Charlotte mocked her sister and husband, while the fans continued to go mild. Charlotte used her Rolling Headscissors, but Brie Brie'd Up. Someone was bleeding because the referee put on the plastic gloves, but it wasn't obvious who. Brie used a running small package for a 2 count. Brie used a Missile Dropkick, but came down selling her knee. She used the Daniel Bryan kicks and the X-Factor for a 2 count and then had on a single legged crab. Charlotte powered out of it, no sold being in a submission hold for over 30 seconds and won with the Figure Eight. Before the match we got a video package that included footage from Nitro in 2001, featuring the Jung Dragons, Air Paris, Elix Skipper and Kid Romeo. Air Paris is somewhere looking for his royalty checks when this DVD comes out. The entrances to this match were the biggest reaction on the show so far. The match was great from the opening bell. Jericho took the advantage when Styles went for a slingshot dive outside the ring and Jericho nailed him with a beautifully timed dropkick. AJ used his springboard into a Scorpion Death Drop, which may have been the first time he used that in WWE. Byron Saxton did his best to bring down the quality of this match, with the highlight being his announcement that AJ and Jericho had "strategizing sessions" earlier this week. AJ went for a Springboard Something, but Jericho did his springboard dropkick and dropkicked AJ in the ankle, forcing the former IWGP Champion to come crashing down to Earth. Jericho got on the Walls of Jericho in the middle of the ring, but AJ scratched and clawed and got to the ropes. Jericho tried to do the old "Swing your opponent from the ring apron into the guardrail" spot, but the dasher boards are too far away from the ring and they missed them badly. AJ got his hand under the ropes after a Codebreaker and Jericho screamed at him that he was stupid. That was cue for AJ to make his comeback...and Jericho kicked out of the Styles Clash. I seriously don't remember the last person to do that. AJ them slapped on the Calf Crusher and Jericho had to tap! AJ Styles wins the three match series. After the match Jericho aggressively shook his hand. -Up next is the Cutting Edge Peep Show. I would like to remind you that New Day cut promos all week that they would be cutting a promo on this show. Anyhoo Tony Chimel returned so he could go through puberty again when saying "Rated R Superstar". The whole point of this segment is to tell you to watch the Edge & Christian Show That Totally Reeks Of Awesomeness. Lance Storm got a reference when Edge asked if he could be serious for a minute. Edge & Christian took credit for New Day suddenly becoming entertaining last year, saying the ripped off E&C. New Day said no one was better than them. Not The Ascension, Uso's, Dudleys or League of Nations. They called the LON hot garbage. That is setting up a weird match, eh? This, of course, brought out the League of Nations. Xavier takes about 3 bumps a month, so he had to piss off the team with more members than them. New Day left instead of fighting, so the heels threatened E&C. Del Rio brought up being the reason Edge retired. Edge made a joke, but they left. Walking up aisle Edge called them the International House of Dumbasses while New Day did a booty dance. That was it. Okay then. -Well before the main event we got the Social Outcasts. They talked about being on the road to WrestleMania. This brought out R-Truth for a bonus match? This is a real match. The fans were more into this match then they were to at least 2 other matches. Anyway the Outcasts all interfered and Bo led a victory lap. Goldust ran down to somehow even the odds at 4 vs 2. Despite that Axel rolled up Truth for Curtis Axel's first ppv win since May 2014 when Rybaxel defeated Goldust & Cody Rhodes. If I posted "Roman pins Ambrose after Bray attacked Brock", would that be considered a spoiler? Brock was by far the most popular of the three. Ambrose got quite a few cheers and Roman, to the surprise of no one, was booed. Roman gets a German Suplex right out of the gate. Ambrose is treated like nothing. Not that Roman fared much better, but Ambrose got treated worse than Seth Rollins did in the Brock match. Roman got a second German and Ambrose got a belly to belly overhead suplex after trying a German of his own. Roman got a 3rd suplex and a 4th and an F5. Ambrose saved the match from ending in 3 minutes. Ambrose slapped Brock and got killed. Ambrose got his 3rd suplex....and his 4th....and his 5th. But when he went for an F5, Roman ran in with a Spear, almost winning the match. Roman got a Superman Punch and went for a 2nd one outside the ring, but got caught for an F5. Before Brock could deliver it, Ambrose punched him in the groin. Is that the only offense that works on Brock? Anyhoo, Roman and Dean teamed up for a double power bomb, sending Brock through the German announce table. Ambrose got to get some offense in here on Roman. Brock woke up, so Dean and Roman stopped what they were doing to go destroy Brock some more. This time Brock got the double power bomb through the English announce table. It's repetitive and redundant. It's repetitive and redundant. This time Roman got the advantage. Ambrose came off the middle rope, but got a Superman Punch to the face. Ambrose did get the near fall to end all near falls with Dirty Deeds. For one teeny tiny split second you thought he was going to win, but Roman kicked out. Roman picked Dean up for a Samoan Drop, but Brock ran back in and German Suplexed the two of them, which is 6 for Dean and 5 for Roman. 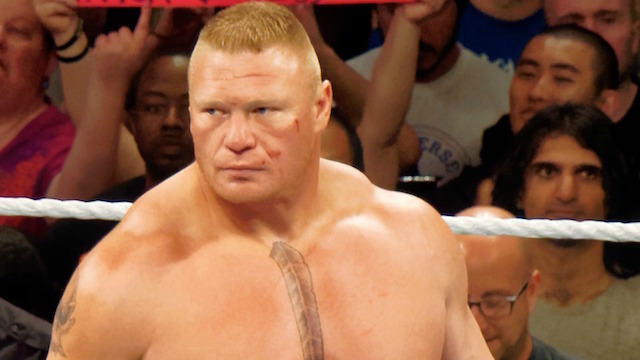 Roman Speared Brock, but Lesnar got the Kimura on! Roman picked Brock up...as Ambrose came in with several hard chair shots to Brock and Roman. Brock fell out of the ring...Roman speared Ambrose and won! Oh well, I think we all got the finish kind of wrong, but we all called the result. In 42 days at WrestleMania 32, Triple H will defend the WWE World Heavyweight Championship against Roman Reigns! No CM Punk, but we did get Triple H, who came out to mockingly applaud Roman. We got the staredown as the show ended.